So in my last post, I wrote about a saison I made with my normal house saison yeast, the Saison Dupont strain (Galaxy Saison with Dupont Yeast). I have been talking with people about their saison yeast preferences and people do not like the Dupont strain for a variety of reasons. People complain about it stalling out (never happened to but I can see how that would be annoying), people have told me that it doesn’t fall out of solution very quickly (I do experience this problem at times) and I’ve heard that is dulls hops in beer…this could be a problem since I seem to make a lot of hoppy saisons. So, what strains play better with hops? According to George, the head brewer at DOG brewery in Westminster, MD, the Blaugies yeast works well with hops…allowing more of the hop character to come through. The Blaugies strain is reported to be closely related to the Dupont strain. I received a few bottles from places that use this strain in hoppy Belgian ales and I cultured it out of an unreleased beer from DOG that was labeled, “Belgian White IPA Test Batch #2”. In order to make this as good a comparison as possible I brewed the same beer twice (a double batch would have been better but I cannot brew 10 gallons currently) and pitched the different yeast starters. I made the Blaugies batch first and then a week later I made the same beer with the Dupont yeast. The post on the Dupont beer made it to the blog first for reasons explained below. Sorry for the somewhat redundant post but this was interesting to me at least and the outcome surprised me. Grain was mashed with 4.5 gallons of water at 153 F with with a pH stabilizer added (5.2). Mash went for 70 minutes. Wort was vorlaufed for about a gallon. 5 gallons of sparge water was added. The runoff was vorlaufed again for about a gallon, or until the debris was not present. I think I’m going to change the way I sparge beer starting with the next batch. I’ll explain later. Wort was boiled for 70 minutes total. Wort was chilled by immersion chiller for about 35 minutes and drained into a fermenter out of the side port on the pot. Hot break material was held back by a mesh screen attached to the inside of the port. A little less than 5 gallons was collected. I grew up a 1.5 liter starter of Blaugies in YEPD media and allowed the cells to crash out of solution for 24 hours in the fridge. I added the starter to the wort and fermentation started almost immediately. After a couple of weeks, the gravity was near terminal (almost 1.010) but the yeast had not dropped out of solution. After another week of waiting, I transferred the beer to a keg and cold crashed it. This beer spent way more time in the fermenter than I expected, and for a hoppy beer this really annoyed me. There are a few procedural things that I have to bring up. I have not been “dry hopping” in the traditional way people do it. I have been “hop backing”, that might be a better way to put it, in the keg. For the remaining Galaxy saisons (there will be at least four more of these this year), I will be dry hopping in the fermenters like it is done at breweries…the reason for this will hopefully become clearer in the coming months. The biggest aggravation with this beer has been the yeast…through and through. It wouldn’t drop out. The flocculation on this yeast is low in my hands…and I don’t like that. The starter didn’t seem to have a problem dropping out, so why in the fermenter. Every sample I pulled tasted like yeast. No Bueno. I hope subsequent batches floc better or this will not be my new house strain. Seriously annoyed. That’s what everyone else thought, what did I think? I mostly agreed with the consensus. I think they beers (and most agree with this) are remarkably similar and if not served side-by-side they would be hard to tell apart. These beers look near identical (yes that is a mason jar). Both are really hazy but after three weeks in the fridge, the cloudiness is most likely due to yeast cells STILL in solution rather than anything else. I took some to work and spun it down in a centrifuge and it drastically improved the clarity and there were definitely yeast cells in the bottom of the tube. This adds to my frustration with these beers. The aroma on this beer is definitely more hoppy / fruity than the Dupont. More of the galaxy hop character is getting through. It could still be more but this is a nice property. There are fewer esters coming from the yeast as well. Beer is pretty smooth, it isn’t dry but there is more bitterness than one would expect. The hops are shining through more than the yeast in this version but again I wish there was a little more hop flavor and a little less hop bitterness. The finish is nice, slightly wet finish on the beer and a little lingering bitterness, no aftertaste. Overall, I think I have a new house yeast strain for hoppy saisons. I’ll finish out a few experiments with the Dupont strain but hopefully a few rounds of selection for cells that do flocculate and I’ll have a better strain that can crash out easier. I will have no problem drinking this beer or sharing this beer. Both versions are really nice beers and I’m proud to say that I made them. I’ll pull back on the bitterness a bit and try to get the yeast out of solution but otherwise I have no complaints. Clarity and hops are the biggest problems I can see with this beer. Much like the last beer, this needs more late hop additions to shine though. The yeast character is slightly lesser in this beer, less phenolic, less pepper, but the two beers are very similar. I am going to attempt some clarifying in subsequent batches of these beers and likely doubling the late addition hops (I need to order more galaxy hops). Since a lot of the clarity issues are caused by cells in solution, maybe I should look into a gelatin to pull the cells out. Something I am seriously considering at least. I would like to get the carbonation level higher in the kegs without excessive foaming when dispensing. I will have to increase the length of the hoses to achieve this, maybe this is a good weekend project for me. 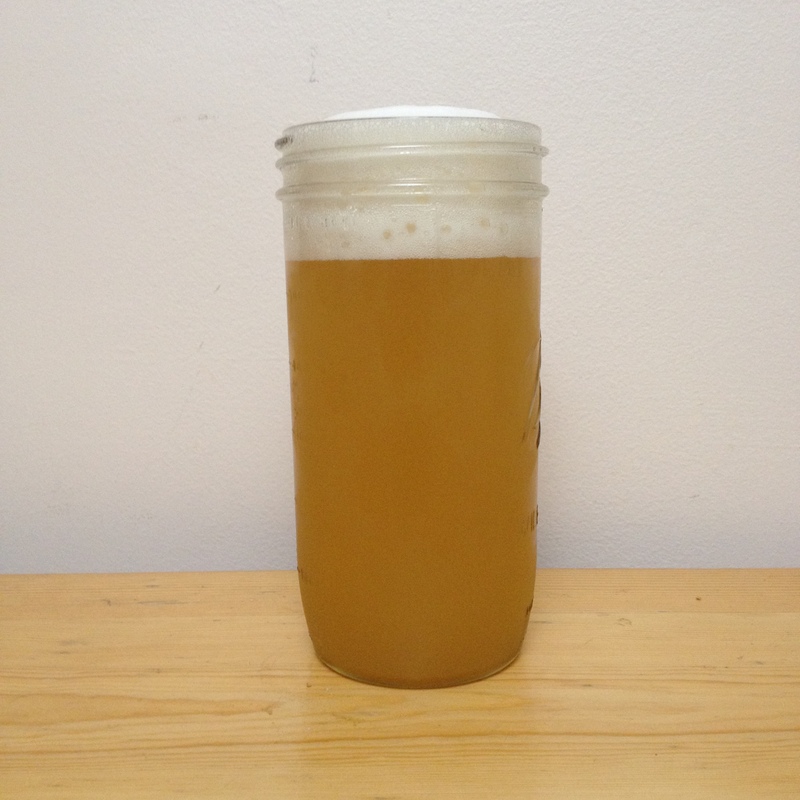 I rebrewed this beer but added more hops at the end of the boil, it is currently fermenting and I seem to be having the same problem as before…there is a ton of yeast in solution. I’m hoping it will drop clear but I’m not holding my breath. It has been fermenting for about 2 weeks and it is doing a good job working through the wort…I’m hoping this one is slightly hoppier. I am currently kegging up a brown saison with cascade hops I did that I’m really excited about. I ordered a bunch of grain to do something really outside the box for me, I’m finally brewing my Russian Imperial Stout. I want to get that in the fermenter ASAP so it might be ready by Christmas. Pretty excited to push my equipment to the edge on this higher gravity beer. Expect a few more experiments with this galaxy saison coming up too. Do you do any sort of water treatment or use pure O2? One or both of these things really helped my yeast to floc. Unfortunately, I started adding Ca additions right to the kettle (replacing my sparge addition with a kettle addition) in the same batch as I used pure O2 for the first time, so I can’t say which of these helped. Also, perhaps this is due to the fact that you are using bottle dregs, if I understood correctly. Assuming these dregs are the yeast left over from the primary ferment of the original batch (not added later for conditioning), this yeast would represent the least flocculant of the batch. Perhaps you could try culturing it in a few starters and selecting the first bit of yeast to floc, or get it from the brewer more directly? Love’n this hoppy saison series! I do not use oxygen, maybe I should look into that. I agree with the bottle dregs thought. That’s one of the reasons why I think I will eventually get there since the act of racking the beer selects for the yeast that flocculates faster each time. I do some water chemistry on some of the beers but not on these saisons yet, I’ll do some math today and the next time I brew it I’ll mess with the calcium and sodium levels. I’m going to be doing an imperial stout also in the next two months. But since my method is all grain BIAB, I have to boost the alcohol by adding adjuncts to the boil. I’m going to do a combination of lactose, brown sugar and DME. Good luck on your yeast problem. I’m a pharmaceutical microbiologist, and unfortunately those critters can be unpredictable. email me at gmail matt.humbard and I’ll send you some. You might want to ask the brewery which yeast supplier they are buying from. If they are referring to it as the Blaugies strain, it is likely WY3726 Farmhouse Ale from Wyeast, which is a seasonal offering to homebrewers, but offered every year. I use it, and it while I would classify it as a bad flocculator, it certainly isn’t the worst that I’ve ever seen.